There are dishes in life for which everyone has a recipe – this is one such dish. However, as with most, it is eminently possible for one to put in a little more effort and have ones mouth reap the rewards. In my experience, macaroni cheese is best when it isn’t overpowered by the flavour of a catastrophic quantity of mature cheddar; that’s not to say that it shouldn’t contain cheddar, but it needs a little more complexity to become truly exceptional. By far the best way of accomplishing this feat is to infuse the milk used to make the cheese sauce – it adds a surprising depth of flavour which gives the dish a certain gastronomic eloquence. Don’t let me limit the scope of your mind regarding the flavours with which you ought to infuse your milk. However, the most commonly used ingredients in this process are things like bay leaves, cloves, pepper corns and onions. A pinch of nutmeg also goes down well, particularly in pasta dishes like this or lasagne. It takes a little extra time, but the process of infusing your milk is rather simple and will infinitely improve any milk based sauces you make. Guidance about how to infuse your milk can be found below, though I suspect most of you have some experience of it already. You’ll be glad to hear that my life in Bristol is going rather well; the estate agent has seen fit to do some work and as a result we now have a flat. The job is also going particularly well and I’m enjoying writing about more important issues than food. Actually, who am I kidding? There’s nothing more important than food. On with the recipe! 1. Begin by infusing your milk. To do this simply heat the milk over a low heat along with the bay leaves, the onion studded with the cloves, peppercorns, a pinch of nutmeg and a little Dijon mustard. Heat for up to an hour if possible, but half an hour will do nicely. Make sure not to let it boil. 2. Put the pasta on to boil and preheat the oven to 200C. Sieve the milk to remove the bay leaves et al. Heat the butter in a saucepan, mix in the flour, cook for a minute or two before whisking in the milk and cheese. It should achieve the consistency of slightly thin custard. Drain the cooked pasta, mix the cheese sauce in and transfer into a casserole dish. Season in necessary. 3. Grate the parmesan over the top of the pasta, sprinkle over some cracked black pepper and cook for 20-30 minutes, or until golden. Serve immediately. 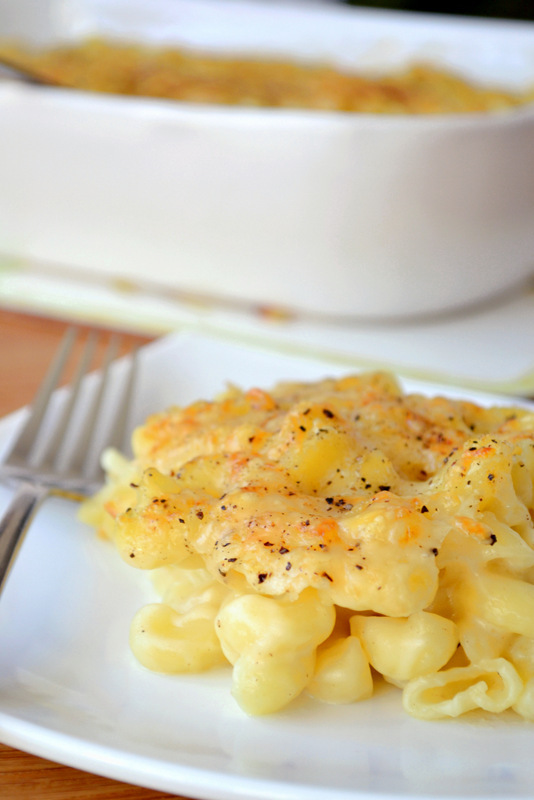 Cost: Macaroni cheese is one of those very basic recipes that seems to always cost very little to prepare. This recipe is no different and should set one back a mere £1.80. Oh yes, it must be mature… and be REAL cheddar. Not that orange jack or whatever it’s called in America… You’d better eat! Hahaha! Yep, we’ve got some nasty orange cheese over here. Although a few local Washington dairy’s make a lovely aged cheddar, free of the orange color, and we always have a steady supply of fantastic English and Irish Cheddar. One of my fave’s is Coastal. What are your recommendations? I might be able to find it here. I have seen… :D. That’s good. Umm – I doubt it, I tend to buy the locally produced ones that don’t travel very far. If you can find one called Tickler that’s really nice. I’ve never thought of infusing the milk for my mac and cheese. I must give it a try! Also, I noticed your recipe calls for Dijon mustard. I think that’s brilliant! It’s true – you can! Mixing the flour with water makes a slurry. A roux requires that the flour be cooked in fat until the raw taste is gone. Roux is fast, easy, and much improves the flavor over using raw flour in water. Just like my Granny made! 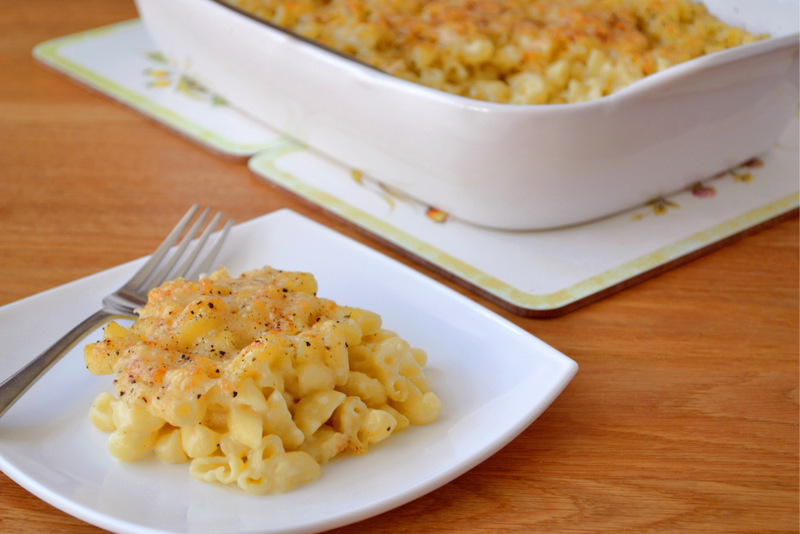 She was an old cow, but she made a decent Macaroni Cheese – cheers for the nostalgia! Glad to hear things are good down in Bristol! Fantastic! Oh no… I loved my Gran. Still do, even though she’s popped her proverbial clogs… 😀 Thanks, Juls! I agree Nick – nothing is more important than food – however it is lovely to focus the mind on other matters as well! Love this and have never thought to infuse the cheese sauce – this is fabulous! I have to agree with drgaellon about the roux. And depending how long you cook the butter and flour before adding the milk, you will get a nice nutty flavour coming through. But great looking macaroni cheese. Can’t beat the basics, and it’s just the dish for the autumn evenings that are beginning to roll in. My own macaroni cheese has got a bit out of hand, with additions of tinned tuna, red pepper, sauted onion and mushrooms, frozen peas, carrot etc. In fact, what I do is saute the veg, then if necessary add a little more fat and the flour, and then add the milk. You prompted me, I did make a proper roux for this – am changing the recipe now! I just completely forgot! I adore mac and cheese and agree re Cheddar. I also add in a dash of horseradish! Sounds like a great idea, I’d imagine it does something similar to the mustard. We do a similar mac n cheese. It is a traditional holiday dish for us. Oh fantastic! It works well, doesn’t it? It really does. My Grammy used to make it so we’ve kept that tradition alive. Infused milk! Fabulous idea Nick! I did a smoked coconut gouda (homemade) mac & cheez last night, with dijon of course! Next time I’ll try the bay leaves and peppercorns in the cashew milk. I want to, but I have no idea when I’ll be up and running for blogging in Bristol! I need new equipment and perhaps even a new table, or at least some planks I can customise! I don’t want to let it down! Oh come on, you could do a lentil stew and it would be smashing. Nothing would be a let down. Everything you make is fabulous…. Surely you’ve got something up your sleeve. I’m sick and tired of everyone’s “fancy planks” and your old table is simply lovely! 😉 I’ll stop harassing you now 🙂 Promise! But I won’t have that table in Bristol, it’s my mother’s! I’d rather have a plank than a not-so-nice pine table… we’ll have to see once I’m settled. I know it would taste good, but I want it to look good to – I’m a perfectionist :D. Ok, look, I’ll sign up! Loud Cheering and Whooping!!! WOOHOO! p.s. as if I couldn’t tell you’re a perfectionist! 😉 THANK YOU!!! p.s. Shira photographs a lot of her food outside on the ground on her deck, I’m sure you’ll come up with something, but yes, it’s a shame to be losing your mother’s table. I’d rather shoot inside. But I’ll come up with something. No worries! What section do I do?! Soup?! That would be good I suppose. Here’s a hint, look at the course list on the site, the earlier the course, the more hits you’ll get. 🙂 But yes, your soups are incredible. It’s basically a pre-scheduled post, nothing tricky the only thing you really need to do is provide links in your post to the site before and after yours in the line up. I’ll email you deets soon. Thanks again. Grinning ear to ear! Well, I’m flattered to be THAT wanted… devoted meat-eater that I am. You’ve got some of the best vegan recipes in our “little sphere” give yourself a bit more credit! It’s probably best left to others :D. But thanks! I didn’t reply to this bit. Thanks! That sounds delicious! Yes, give them a go – it works very well! No worries Nick! It’s crazy the stuff I’ve come up with to get around dairy, but I enjoy a good challenge! You know, I’ve started to feel slightly bad whenever I drink milk – I love it too much to stop though. Things like butter are fine though, they tend to be less likely to set these things off right? Thanks! It worked very well. The infused milk bit is exactly what my mum and now me do when we make bread sauce…. Mmmmm love bread sauce….. And it sounds like a fantastic addition to macaroni cheese. Will try it next time. Fantastic! Give it a go! I know! I’m a meat eater too :D. It’s not that big here either, but this is delicious :). To be honest, this one doesn’t use loads of cheese and uses semi-skimmed milk so it’s not THAT bad. But, yes, I only very rarely eat it! I like my feet. I like using wholegrain mustard in my sauce – and mix the topping cheese with breadcrumbs for a bit of contrasting crunch. Brilliant shots on this entry – making my stomach growl. Nos Da. I’m not the biggest fan of wholegrain… for me it would overpower the dish. But that’s a personal preference. I was toying with breadcrumbs, but I thought I;d just crisp the cheese up. Thanks! You too! Thanks! Hehe, I hope that it doesn’t! Infused milk! What a brilliant idea. I wish I could like the post more than once. I’m trying this with my next mac & cheese. Thanks! I wish people could too :D. I know you’ll love it! Oh my goodness yes…I want this now. That’s a lovely smear of cheese stuff in the photo, Nick — beautiful color. Oooh, the milk infusion sounds delightful. I like to eat my mac and cheese out of a bowl with a spoon… pure comfort food! Absolutely – it really is! How did you know that I have been craving macaroni and cheese today? I love the infusion of milk and the flavors! Looks delicious! 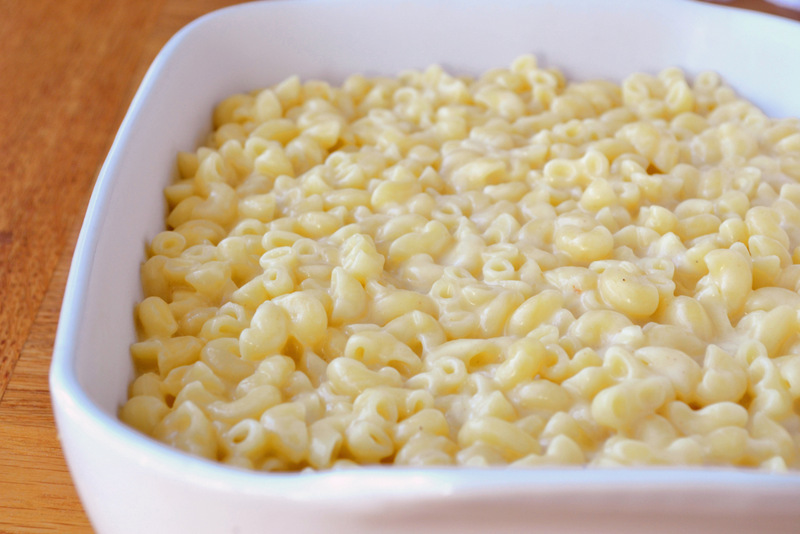 You have set me on a challenge for gluten free Mac and Cheese… I’ll get back to you when I make my version! Your wording masks me want to cook. Thank you. Yes! Let me know – I’m sure you’ll work it out. thank you too. Haha – nice! Thanks – everything seems to be going so well! You, sir, are a genius. I will be doing this next time I make mac and cheese. I agree that it usually lacks depth and character, but the possibilities are endless with a technique like this. Love it! And might I add – your photos are looking lovely! Thanks, Willow :). Not as good as your photos yet though. Yummy! I love Mac and cheese. It’s my favorite! I use Vermont cheddar and yellow american. It’s pretty awesome, but I’d love to try your infused milk recipe. And I also, love lots of pepper! Me too! Pepper is great! The ultimate comfort food! Looks delicious, as always Nick! 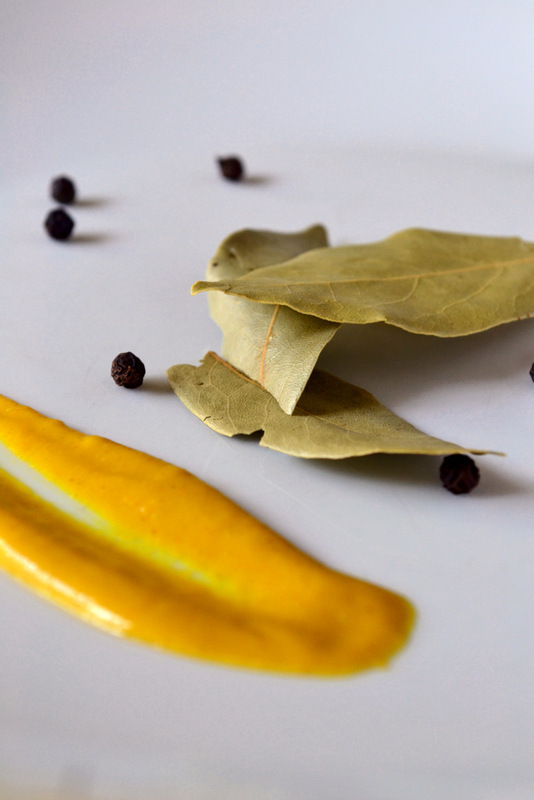 Nice bay leaf, mustard photo. Thanks! A little dark, but still. Mmm macaroni & cheese, the ultimate comfort food. Thanks for this & hope you’re enjoying Bristol! It is indeed! Bristol is fantastic. I thought about using breadcrumbs but decided against it. I didn’t want it too cheesy either, it gets a little heavy I find. Absolutely! Not a bad idea! I tend to like it a little more simple – though tomatoes on the top are always nice. Good to hear about the flat. I like your spice mix. Can’t beat nutmeg. Nutmeg is a must in white sauce, Greg. Really? That’s funny :P. I’m not a big fan of mustard – it adds a little more interest, nothing more.